Unbeaten Clifton Rangers U16s are going from strength to strength in the Poulton and District Primary League and have won the first phase of the league championship. And they are not just doing well in the league, as a 3-2 win against Walshaw Sports Club saw them progress to the last four of the Lancashire Cup. They will now face Ribbleton in the semi-final on January 8. The quarter-final was always going to be a tough test against a Walshaw side who won their league last season. But Clifford got off to a perfect start as Alfie Tomlinson put away his free-kick from 20 yards to make it 1-0. One soon became two after Jack Butler scored with an impressive header. Some great football was played from both sides in the final stages of the opening period, with Clifton heading into the half-time break 2-0 up. 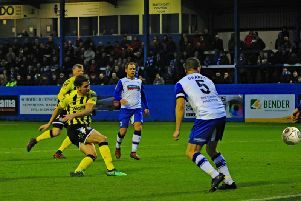 But Walshaw scored early on into the second half, which brought the game into life and both sides went close. Clifton thought they had the game sewn up only for Walshaw to equalise in the last minute. With the game looking destined for penalties, there was another twist as Clifford bagged a dramatic last-gasp winner straight from the restart. The goal came in amazing fashion too, with Finley Clarkson hitting a great strike from inside Clifton’s own half which went flying into the back of the net. Great celebrations followed as Clifton found themselves in the semi-final in their final year of junior football. In the U15 division, YMCA edged a thriller at home to local rivals Lytham Juniors, coming out 3-2 winners. The visitors enjoyed most of the possession and took the lead in the 20th minute with a snapshot from the edge of the area. YMCA responded well to going a goal down and levelled the scores five minutes before half-time with a fine team goal. They gained possession well inside their own half and a slick passing move ended with Toby Grant firing home from 20 yards to make t 1-1 at the interval. Lytham regained the lead soon after the restart with a lob from the right, but again YMCA responded well with some fluent football. They equalised with an excellent strike. Harvey Shaw collected the ball on the left and rounded several Lytham defenders with some neat footwork before finding the top corner of the net with a superbly accurate angled drive. Midway through the second period, YMCA took the lead for the first time with a spectacular effort. A Lytham clearance fell to Taylor Stock on the halfway line and he, noticing that the Lytham keeper was off his line, cleverly lobbed the ball just under the bar. YMCA had to call on stand-in keepers for this match. In the first half Jake Molloy took the gloves and in the second Jeorge Coulthard, who pulled off a vital save in the closing minutes to deny the visitors an equaliser. Grant and Shaw were both industrious throughout in a good YMCA display. The Under-16 Alpha Division of the Blackpool and District Youth League is hotting up afters St Annes Greens caused an upset with a 6-3 win over league leaders Lytham Juniors Home Heat, who had not lost all season. Lytham raced into a 2-0 lead, with Max Older netting both, but St Annes soon drew and Older completed his hat-trick before the break. Lytham continued to waste chances before St Annes scored four unanswered goals, with Kaleb Chikites leading the way with a hat-trick. Matt van Wyk also netted a brace, while Liam Booth was also on target. This gave Poulton the chance to close the gap, which they duly took as goals from Stephen Lambert and Ryan Norman gave them a 2-0 win at Warton Typhoons. Poulton are now only three points behind with games in hand. An Ethan Hallett penalty wasn’t enough to give third-placed Foxhall the win against Kirkham as Jake McLeod’s goal ensured the points were shared. The only game to be played in the U18 Alpha Division saw Fleetwood Town secure an impressive 11-2 win against Warton Typhoons. Jacob Cheeseman, Mike Rose and Danny Carr all bagged braces, with Joe Barrat, Will Brown and Lucas Bradley also scoring. An own goal completed the tally and Quaid Henderson scored both of Typhoons’ replies. Meanwhile Foxhall are the new leaders in the U13 Alpha Gold division as goals from Aiden Wright (2), Dylan Henshall (2), Jake Marshall and Harry Melia sealed a 6-0 win at Poulton. BJFF Blades slipped from the top as a Harrison Giggal goal wasn’t enough to beat Squires Gate, for whom Angel Karadzhinov replied. A Taylor Joyce hat-trick set Fleetwood Town on their way to an 8-0 win against Thornton Cleveleys Reds. Alex McLoughlin grabbed a brace and there were further strikes from Callum Gawthorpe, Jordan Rankine and Tyler Anunan. Thornton Cleveleys Whites have cut the gap at the top to just two points as goals from Adam Meadows and Prince Yelegon handed them a 2-0 win at Lytham Blues. Leaders Layton went down to a 1-0 defeat against Kirkham Juniors Red, with Reece Johnson scoring the decisive goal. Kallum Illingworth and Kyle Costin both scored hat-tricks in Lytham Maroons’ 7-0 win over Foxhall Hoops. Finlay Best was also on target. Macawli Hannah was another hat-trick hero as BJFF Vipers saw off FC Rangers 5-1. Harvey Hampton and Jake Wilson were also on target, while Ryan Henson netted Rangers’ consolation.